For case managers, there may be no objective more powerful than engaging and activating patients with chronic illness to self-manage their own disease. Armed with the right training and resources, care managers can play a vital role in educating, coaching, and connecting chronically ill patients with effective interventions and programs that result in better health outcomes, reduced utilization, and more satisfying and positive healthcare experiences. 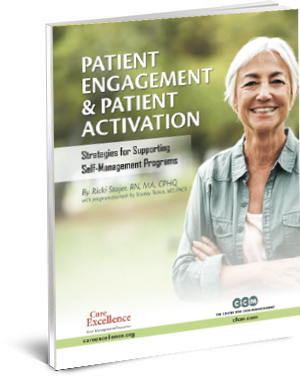 This eBook examines the evidence base surrounding patient engagement that leads to effective self-management, models that enhance patient activation, and the role of care managers in educating and engaging patients to improve outcomes and reduce healthcare costs. Click Here to Sign Up for the eBook! The Institute for Healthcare Improvement found patients need three things to successfully self-manage chronic illness: Basic knowledge about their disease, help to learn self-management skills, and continuous support from healthcare providers, family or friends and the community. Highly trained case managers are key in providing that support, as well as in educating patients about chronic illness and enlisting community resources to help reinforce healthy behaviors. Check Out These Self-Paced Care Management Courses That Can Help You Better Engage Patients! Give us a call with your questions at: 760-750-7285.